Where Roots And Wings Entwine: SnuzPod Love. We have been using our SnuzPod for a few weeks now as we enjoy life with Jelly Bean. Both Lee and I are very impressed with it and I wish I had had one with Bug when he was a baby, being truly grateful that I have one in my life now for Jelly Bean and hopefully any other babies we have. I really cannot say how much we love the SnuzPod. To try and express how much we love the SnuzPod I thought I would share with you 5 reasons why we have big SnuzPod Love. Whilst Lee insisted on doing the daddy DIY and putting the SnuzPod together when I was pregnant ready for Jelly Bean’s arrival I watched him assemble it and we are both impressed with how easy it was assemble. The SnuzPod’s clever design made assembly easy and simple. We also appreciate the safety feature of attachment straps to secure the SnuzPod safely to beds when used as a bedside crib. Attaching it to the bed is easy and simple and this design feature provides peace of mind that it can be safely used as a beside crib. 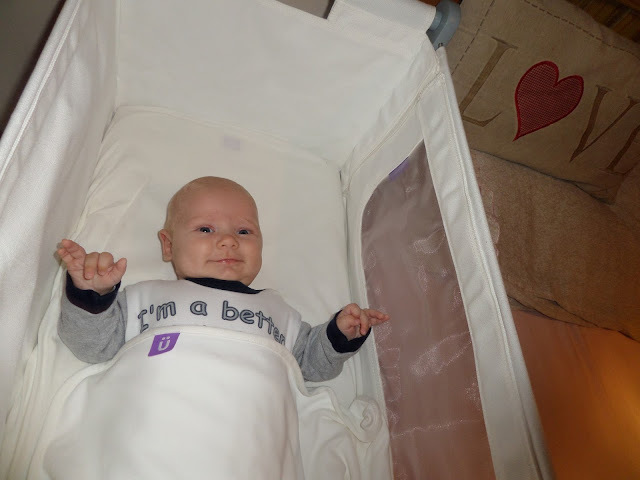 We love how well made the SnuzPod is, with its practical design, and how safe and sturdy it is. Thanks to the clever design of the SnuzPod the underneath is not wasted space as it features a shelf ideal for storing baby bits and bobs. 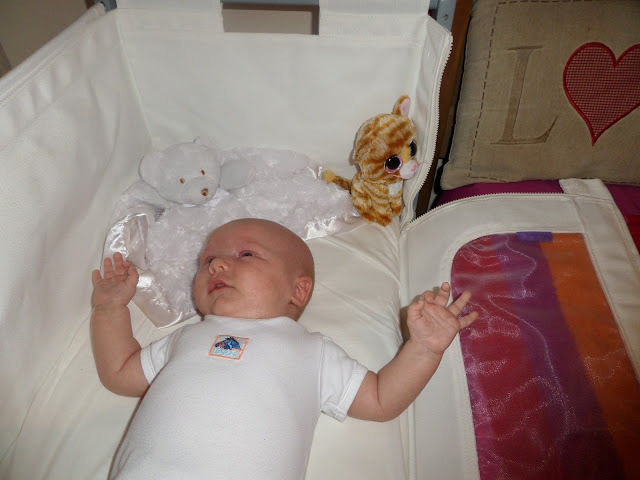 Having space within the SnuzPod to store baby essentials is very helpful especially during the night as I can keep spare nappies and clothes along with other items there to have them to hand for nappy changes and when an impromptu emergency change of clothes is needed. 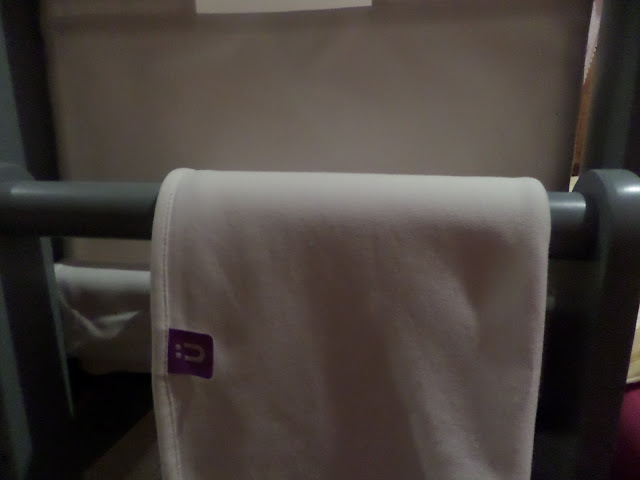 The side rails are also useful for having a blanket or muslin cloths close by. We love the fact that the SnuzPod is versatile and that it can also be used 3 different ways – as a bedside crib, a bassinet and a stand-alone crib. We mainly used it as a bedside crib and love it as one. It meets all of our needs as a bedside crib and thanks to the sturdy, high quality design and attachment straps we feel reassured that it is safe and secure. We also love the fact that you can easily remove the bassinet from the stand to use it anywhere around the house for daytime naps. Being able to use it as a bassinet by itself has been very useful for keeping an eye on Jelly Bean when he is napping during the day when I am not in the bedroom. Having the ability to have him napping in the bassinet in the same room as I am in has been very helpful for allowing me to still have quality one-to-one time with Bug but having Jelly Bean nearby. The rocking motion has also come in handy for gently soothing Jelly Bean to sleep. 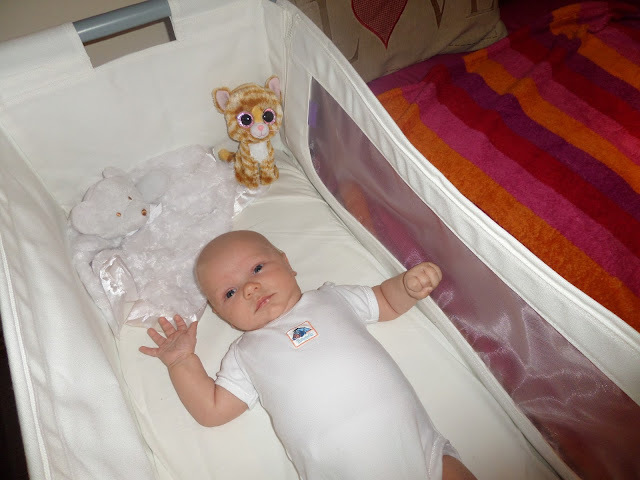 As we have been using the SnuzPod as a bedside crib nightly we have not really moved it from beside the bed bar moving the bassinet during the day for Jelly Bean’s daytime naps, however we have and love that we can when wanted used it as a stand-alone crib. 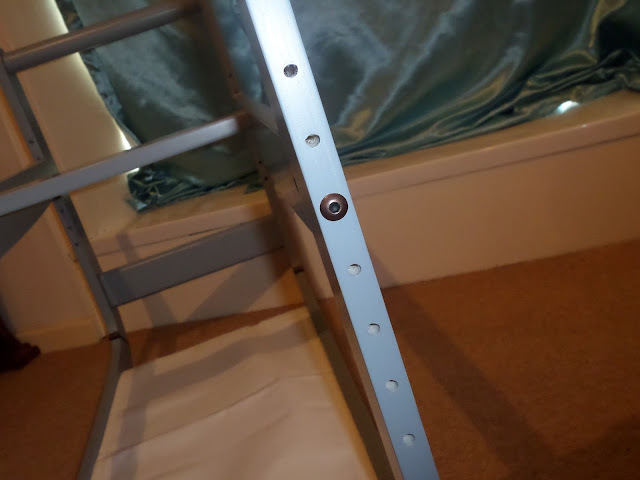 Removing the crib from the bedside is easy by unclipping the attachment straps and moving it to where desired and adjusting the height of the stand to hole 5 or 6. Again we love that like the bassinet by itself when used as a stand-alone crib it can be rocked thanks to the rockable stand design which comes in handy for settling baby to sleep. 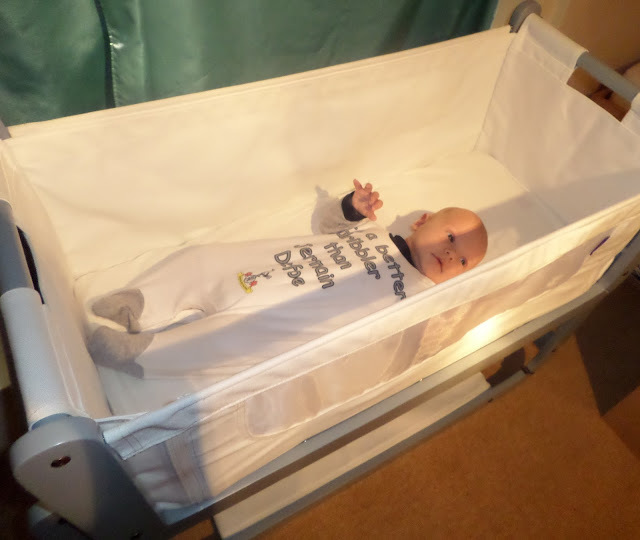 Whilst it is still awhile away for us I can also see how the stand-alone crib would come in handy to make the transition from parents’ bedroom to baby’s nursery a little easier as the baby could sleep in the crib they are familiar with before moving into a unknown and larger cot or cot bed. I love the see through mesh wall as it allows to me be able to see Jelly Bean as I lay down in bed next to the crib rather than having to look over the top of the wall. Being able to watch my beautiful baby boy as he drifts off to dreamland from the comfort of my own bed is heavenly. 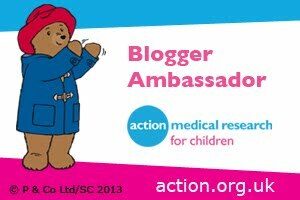 I also love that it is a zip down side allowing me to reach Jelly Bean easier and comfort him without having to get out of bed, allow of which means that I do not disturb Lee as much as I would if I was getting up and out of bed throughout the night to get Jelly Bean out of a moses basket or cot. 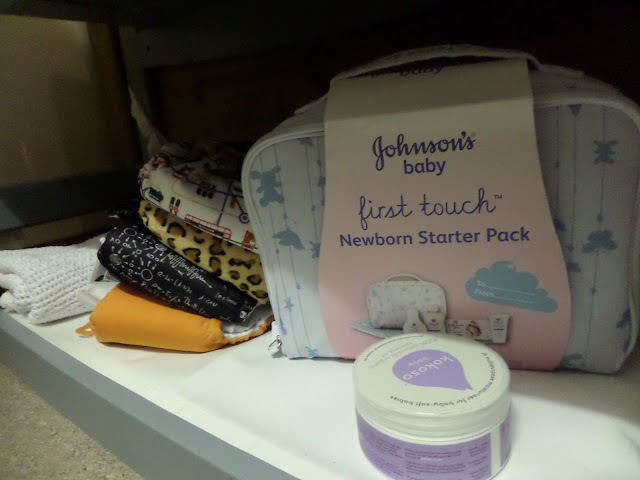 Being able to reach my baby without having to leave the bed was also helpful during the recovery postnatal period and I can see that it would be ideal for mothers who have had a c-section. 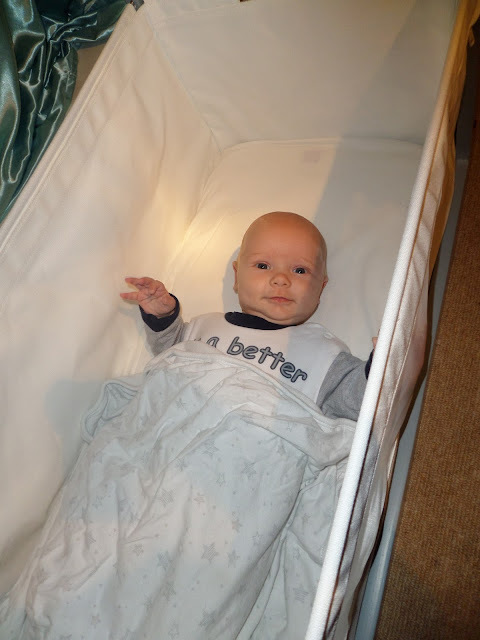 I’ve already mentioned above that we love the bedside crib design and that we use it as one nightly however I wanted to talk about this a little more as it really is the main reason why I love the SnuzPod so much. I love that I can satisfy my desire to co-sleep with Jelly Bean without Lee having to sleep elsewhere as he worries about co-sleeping all together in bed he would prefer to sleep apart. Thanks to the SnuzPod I get to co-sleep with my baby and have my man in bed with me still. As Jelly Bean is in his own space the other side of me against the bed Lee is happy to stay in the bed and see Jelly Bean and I enjoy the benefits of co-sleeping. 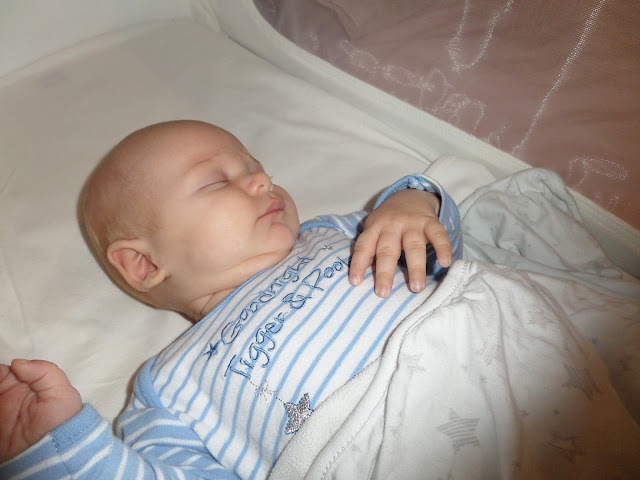 Not only does the SnuzPod allow me to reap the rewards of being close and bonding to my baby by co-sleeping safely it also allows me to breastfeed easily from the comfort of my bed. I can easily reach Jelly Bean for night feeds leaving him in his own space within the crib as I breastfeed him in a side-lying position. Thanks to having a bedside crib there is less disruption and breastfeeding is a lovely and calm experience which is beneficial to Jelly Bean and improves sleeping during the night. I really cannot tell you exactly how much I love the SnuzPod. 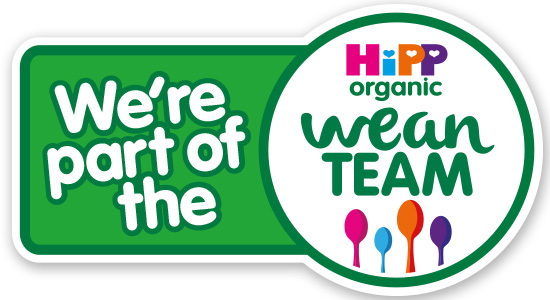 I only wish that there was a bigger cot version so that we can continue to co-sleep safely and enjoy the easiness of breastfeeding side by side during the night for longer than 6 months when Jelly Bean will have outgrown the SnuzPod. 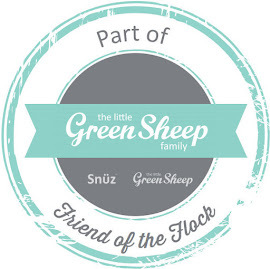 If you want to enjoy some SnuzPod love yourself why not take a look at them on The Little Green Sheep website where you can also find other items for natural baby bedtimes. The SnuzPod is priced from £169.99, being available by itself or as a package with the natural mattress included. The crib is available in 4 different colours; Natural, Eco-White, Dove Grey and Espresso. 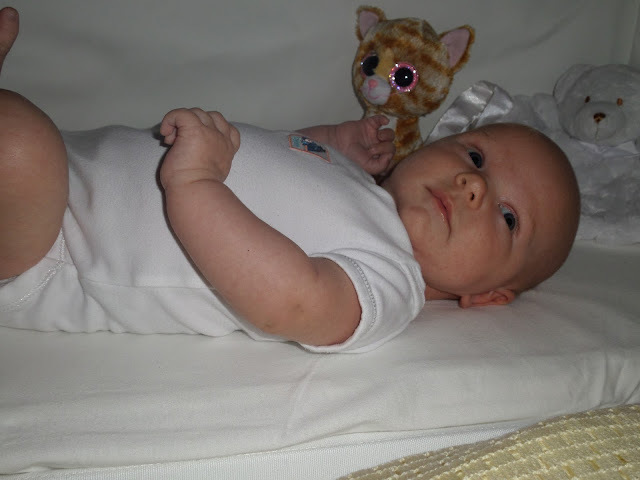 If you are thinking of buying your own SnuzPod or any of the lovely items from The Little Green Sheep website for natural baby bedtimes then please use discount code LGSROOTS10 to get 10% off your purchase.